24 people think this report is great. Since being beaten back by Braeriach in March (Not Quite Braeriach) I've been waiting for a good weather day to bag this monster of a hill. With the "summer" we've had its been a long wait but as it turned out well worth it. Not sure who's report it was that inspired this route (thought it was malky_c but can't find it now) but biking in to Loch Eanaich puts you at the foot of the mountain and leaves you with lots of time to wonder about the summit plateau. Anyway up early and pulled into the empty Whitewell car park a bit after 7:30 & on my way by 7:50. Pushed the bike along the 200m path to the track that runs from Coylumbridge and then mounted my steed and off I went. A couple of deer fences in the first km to negotiate. The track was pretty good most of the time, occasionally getting a bit rocky. The track splits at a wee ford (NH928065) with a curious sign that encourages cyclist to use the lower path to "prevent damage to the track". Go figure. But I'd done my Google Earth research and the high road looked a lot better. Not too steep but I had to push the last 20-30m. Gleann Eanaich - some interesting no doubt glacial formations. Braeriach on the left and Sgor Gaoith on the right. The view south was now magnificent. The track then plunges back down to the river - I bailed out for the last few metres - and shortly crosses the river via metal footbridge. One wide ford to cross - a real MTB'er would ride through but I took the stepping stones - and a number of wee ones which I did splash throw. There has been a bit of work on the track with a JCB & large tractor & trailer parked by the side of the way. Loch Eanaich Outflow - the outflow of Loch Eanaich (into Am Beanaidh). There are some stepping stones to the left but most of these were submerged (& there hadn't been that much rain recently). The rocks straight in front look fairly easy going. But the water between the two isn't that deep either - a pair of wellies would see you through without a problem. 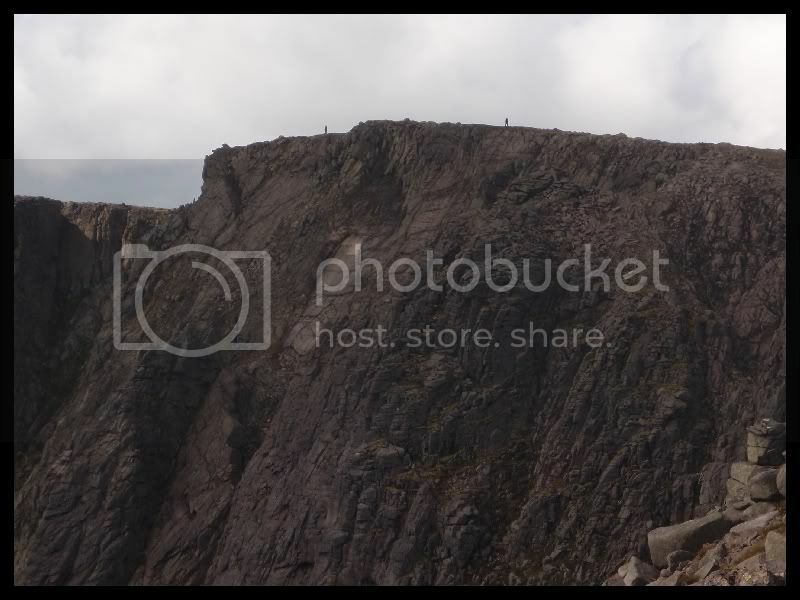 By the time I faffed about a bit, taken some photos & biked back to the Coire Dhondail path the lone walker was just coming into view. She sat and had a bite to eat while I got sorted and eat my second banana of the day. If you knock off the excursion to the loch it took me just over an hour for the 10 km up the glen. The side of the mountain from here looked pretty intimidating. I started to head back the way I come so I could tackle it from nearer the WH recommended route but in the end I decided to just bite the bullet & head straight up the side. I picked a heathery path between two patches of scree/rocks and went for it. To be honest it was brutally steep and the hardest slope I've ever tackled. Sticking to the heathery parts certainly helped as I could grab at the vegetation in front of me. I had to cross one patch of rocky scree and it didn't feel at all stable, so I was glad to get back to the heather. Had numerous short breathers till I got to the just below the 900m mark where the slope easied off where I took a longer stop & my first lunch break. From there it was a comparative doddle and I was back to really enjoying my day. Loch Eanaich - from around 890m on the (very steep) western flank of Braeriach. This is about 200m below the lip of Sgor Gaoith on the other side of the loch. Too many words already so just a few more. Loch Coire an Lochain was a real woooo moment when it came into view. Amazingly blue and well worth a diversion. The reveal when I got to the summit was probably the best I've had. I knew what to expect but it still took my breath away. Loved walking around the rim of the plateau so much that I didn't bother visiting the Wells Of Dee. They didn't look too enticing from a distance so I headed back to the cliffs after crossing the infant Dee. Quite a few folk around at the summit including a Finnish couple I got chatting to. There were also no less that 4 of my Flickr contacts in the area that day. Looks like I just missed HighlandSC by a few minutes while across the way on Cairn Toul G.Scott & friends were have an equally good day - just see Devils and Angels. Also meet my Gleann Eanaich walker again just as I left the summit cairn. Given what I know know I recommend using the Coire Dhondail route to the ascent as well as the descent - if you MTB in you'll have more than enough time to wander & take in Loch Coire an Lochain. Loch Coire an Lochain #1 - at a tad under 1,000m its the highest loch of comparable size (apparently). Well worth the diversion from the more well trodden Braeriach approaches. BTW this is very nearly SOOTC. I've sharpened the surround & de-noised the loch (not that it really needed it) but that's it. I've set up my camera with +2 (out of 5) on the saturation but haven't messed with that aspect in Photoshop. The other photos I've posted that show this lochain don't convey just how blue this lochain appeared on this day. Coire Bhrochain - looking down into Coire Bhrochain and across the Lairig Ghru to Carn a' Mhain & Cairn Toul from the highest point of Braeriach. A vertical stitch of two exposures. Braeriach (Coire Bhrochain) Panorama - a stitch of six (portrait) exposures from the summit of Braeriach. Cairn Toul & The Angel's Peak - standing in the Highlands and looking into Aberdeenshire. Taken from the summit of Braeriach. 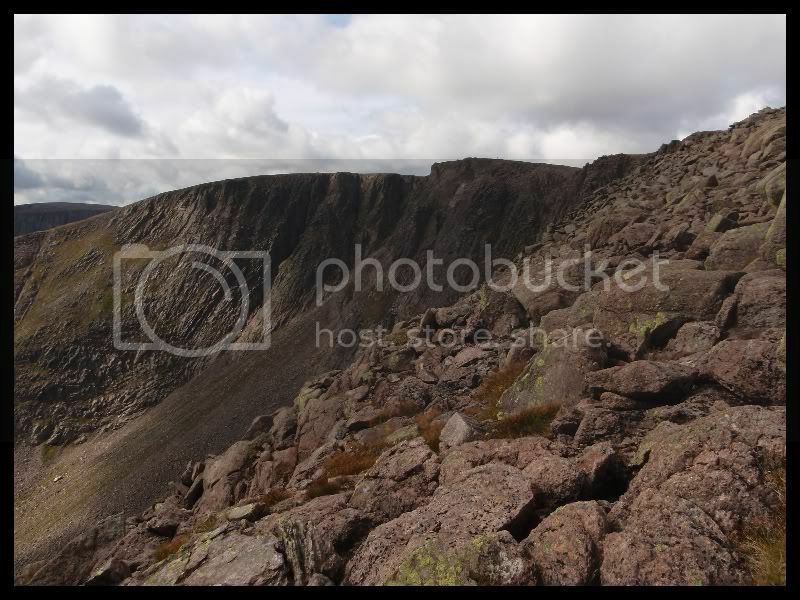 Cairn Toul & The Western Buttress - another view of Cairn Toul that also shows the the Western Buttress of Braeriach. River Moss - moss in the infant River Dee just before it plunges several hundred metres into the Lairig Ghru, with Cairn Toul across the way. Mottled Macdui - from near Carn na Crishe on Braeriach. Lochan Uaine just visible on the right. Sgor Gaoith From Braeriach - from near the Carn na Criche bit of Braeriach. Sgoran Dubh Mor - the northern Top of Sgor Gaoith with Loch Eanaich below. Ready To Go - looking forward to a long downhill run back to the Whitewell car park. Loch Eanaich just visible in the background. Redundant Notice - unless you're the likes of Danny MacAskill you have no option but to dismount. On the way up I took the upper track - which meant two short pushes (one up & one down) - as this looked the better track on Google Earth. The parts of lower, river-side, path I could see from the top track did look rougher. But I took the lower route anyway to see what it was like - there was one very short part that I did walk but and half the track was rougher. But half this track (the northern hidden in the valley bit) is actually better than the upper track & if there are no folks about a real good blast. Full Flickr set (which I'll probably add to) over here. Last edited by Alastair S on Mon Sep 19, 2011 9:39 pm, edited 1 time in total. Another great TR Alastair,your pictures never fail to amaze me. Thats also another fairly long bike/walk also. Bet your glad you did this one last week & not the weekend just past. Fantastic report and pics Alastair- good to see some great shots of the area I was in on the same day. Shame I missed meeting you at the summit, would have been good to see you. I did meet the lone walker you mentioned - we both sat at the summit cairn for lunch. She'd walked a fair distance from Coylumbridge- 6.5hrs to the summit she said. Took me 5 mind you, from the sugar bowl car park via Chalamain Gap....I was in no rush though that's for sure. gammy leg walker wrote: Bet your glad you did this one last week & not the weekend just past. Yer, I'm usually pretty picky about the weather and I waited a long time for this particular one. I think you can see why. Cycling up to Loch Einich is definitely the way forward - allows you to get onto parts of the hill that you'd miss otherwise. Amazing photos, particuarly the blue lochans. fantastic stuff - like you, I am waiting for good weather for this baby - I love your route but I don't have a bike - maybe a wee wild camp at Loch Einich could be the trick before an ascent. You cannae beat the 'gorms! Can I ask, is the lochain that blue or was there some 'enhancement' in your photo? P/M - I won't tell. kevsbald wrote: Can I ask, is the lochain that blue or was there some 'enhancement' in your photo? P/M - I won't tell. The blue lochain piccie is pretty much straight out of the camera - which doesn't necessarily mean it was that blue - quality cameras can be set up to get the 'best' out of a given setting. But it was bluer that the other two wider shots. When the lochain came into view it was a woooo moment - you knew you were seeing something unusual & special. By focusing in on the shallowest, bluest part of the lochain it just seems to have caught the light. Most of the blue in water shots comes from the sky - so I was lucky to get just reflected blue sky in the narrow shot. I also used a polarizing filter which also helps intensify colours in some conditions. As I shoot in RAW I can pretty much adjust everything. If I set this one back to dead neutral on everything it looks pretty flat & dull - not at all what I remembered. So you takes your money and yous make your choice. I like vivid & sharp whereas other folk may like subtle & wispy. With this one if it hadn't come out of the camera so blue I probably wouldn't have gone that far otherwise. As always, top notch photography there Alistair. Planning on doing this one myself when the weather is set fair. Absolutely fantastic photos; professional quality!! Really captures the majesty of the Cairngorms. I can't wait.